The MPR121 IC is a great way to build simple capacitive touch interfaces, and now it’s even easier to incorporate into your Arduino projects with the touch shield. 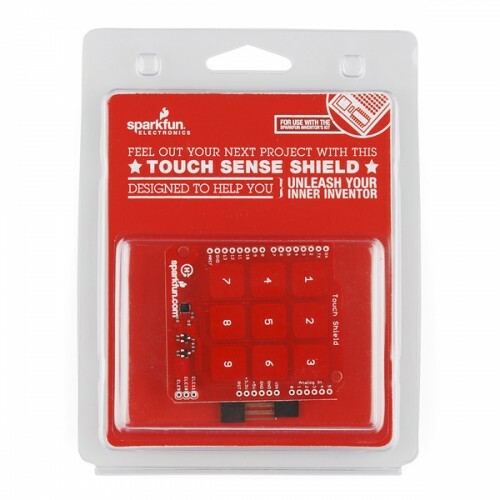 The touch shield has 9 capacitive touch pads, with headers for the remaining 3 electrode connections. With this shield you can have a total of 12 touch sensitive buttons. An on-board logic level converter allows it to work with 5V and 3.3V Arduino boards. Simply solder on some header pins and stack it on to your Arduino for a convenient input device. These come in fancy clamshell packaging meant for our distributors that need it. Regular customers are welcome to order, but we want to limit the amount of extra packaging finding its way into the trash heap.